If you often peruse social media sites, you will be familiar with memes. Introduced over the last few years, these have become so popular in society that a definition has recently been included in several well-known dictionaries- including the Oxford Dictionary- who define the sensation as ‘an element of a culture or system of behaviour passed from one individual to another by imitation or other non-genetic means’. Their second definition, and in this case, the more accurate, is ‘an image, video, piece of text etc., typically humorous in nature, that is copied and spread rapidly by internet users, often with slight variations.’ (https://en.oxforddictionaries.com/definition/meme). While there have been a lot of versions of particular pictures circulating, including those of famous faces, kittens and stick figure drawings, the classic art world has also had its fair share of humorous takes. As a result, a gift book has been released that showcases some of the best of these- Classic Art Memes. Featuring classic paintings from all eras of the art world, including renaissance, baroque, rococo and romantic, these thumbnail selections of paintings have been chosen for their unusual facial contortions or dubious scenes that allow for a bit of creative captioning. It’s difficult to describe the sarcastic humour associated with many of the memes, but take the one on the cover as an example of the sort of style you would be looking at if you were to pick up this book. 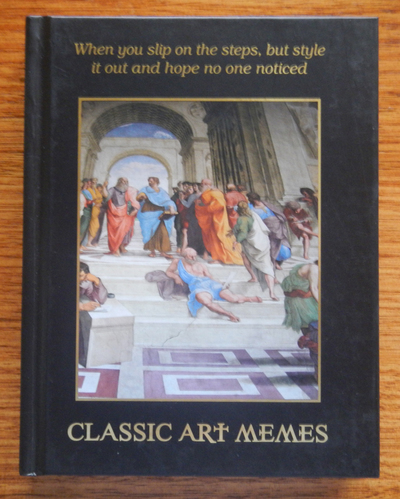 Perfect for lovers of memes or classic art, this little book is good for a laugh. You are sure to find at least one or two images in this vast collection that you can relate to. Would you read a book written by a YouTube vlogger?